2K Says Whites-Only Character Options "Wasn't Deliberate"
2K Play Marketing Director Christina Recchio claims the failure to include non-Caucasian faces in the Carnival Games character customization options was simply an oversight, and not the result of some sinister "whites only" policy at the publisher. 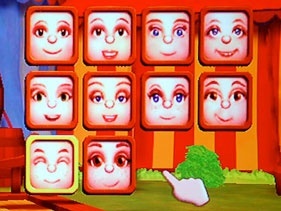 Following the release of the Wii title early in the year, MTV Multiplayer writer Tracey John complained that only "one pale hue" of skin color was available in the character customization options. "In other words, as a minority (I'm a Chinese woman), I could not replicate my skin color for my avatar within Carnival Games (much less if I were African-American or Hispanic). I found that a bit offensive," she wrote. In a follow-up, 2K Play's Recchio admitted the game should have had an option to adjust skin tones, but said by the time the company became aware of the problem it was too late to correct it. "Unfortunately by the time it had gone to manufacturing, it was something that couldn't be changed in the original product," she said. The DS version of the game shipped in July, and includes a color slider which allows players to adjust their avatar's skin tone. The upcoming Carnival Games: Mini-Golf includes 12 different shades of skin colors, and Recchio said Carnival Games 2 will also offer a choice of skin colors. "When we were developing for the DS, it was the first thing that we put in there because we knew we needed a larger variety," Recchio said. "I just think it was - honestly - a complete oversight," she continued. "It was just the developers [Cat Daddy] were developing the game, they got so far down the line it was just something that couldn't be added without affecting the ship date of the game. But it wasn't deliberate, by any means."